If you've seen, used or just heard about my Revenue Sharing script and the excitement it generates, then you're going to be jaw-dropping amazed with this superb new script! Consider having multiple membership lines that can cycle automatically, give member's advertising bonuses, cash profits and a reliable income... With the added ability of being able to know in advance when a membership line will payout, it gives you a competitive edge that simply can't be beaten. This isn't a fly-by-night type of program where you cross your fingers and hope that it will last a few months on your website... In fact, it's been developed to outlast and outwit ALL other scripts because it is fully self-sustaining and members don't need to refer to earn! 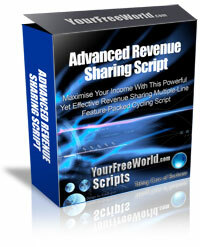 Are You Starting To See What Makes This Script Simply Irresistible To Your Site Visitors? The Lure Of High Earning Capabilities With The Incredible POWER Of Matrix Revenue Recycling! Our revenue sharing script is designed to be flexible for the webmaster that wants to create an individual program that stands out from the competition. Even though it comes complete with a modern site template that you can use straight out of the box, it's easy to customise your own head and footer to fit in with your existing web site should you prefer. With so many options available, the functionality is out of this world and rates far above and beyond any other programs you come across online. Multi-Purpose Script: You can install the script on any domain that you own providing more value to your site visitors. With built-in banner and text ad impressions for your members, we've added instant value with quality advertising options for your members. they can also see at-a-glance program statistics on the home page that can help to encourage them to signup. Business Branding:The excitement generated by this script will make your site 'sticky', and naturally encourage your members to come back to your site time and time again to see how much they've earned. Due to the high activity your site will experience, your brand will gain more recognition in the marketplace. Comprehensive Administration: There are many features that you can customise and control from the management area to suit your business. You have the freedom of choice to set the options, pricing and facilities that you want to offer. Automation: We've made it so repetitive functions are automated to save you time and effort, and make the administration of your script much easier and less time-intensive. Privacy: Your member list is on your domain and your customer database is only available to you and no one else, ever. Dramatically Increase Your Membership Base & Revenue? Extra mass pay functions included for SolidTrustPay and EgoPay provided.